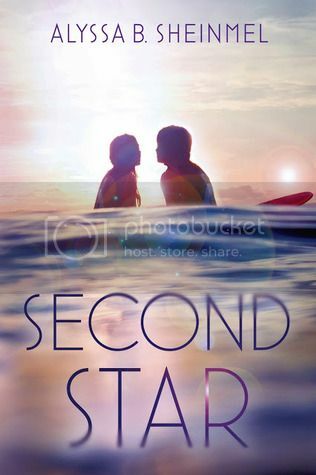 Second Star by Alyssa B. Sheinmel is described as a modern day retelling of Peter Pan. I couldn’t wait to get started on the book because I’ve recently come to really love retellings. Also, I couldn’t resist the gorgeous cover for this book! The main character in the story is Wendy, a teenage girl whose life was turned upside down after the mysterious disappearance of her two surfer brothers. Not wanting to give up on finding her brothers, like her parents have, Wendy sets out to try to find the boys with the help of the mysterious Pete. Wendy was an interesting character. She was very determined to find her brothers, at whatever cost, so it seems. At times it felt that her search was fueled on pure desperation, which leads her to make somewhat irrational choices. Of course, there is a reason for this, but it’s a while before we find out this reasoning. I did admire Wendy for her determination to want to find out what happened with her brothers, and not to let the mystery remain for the rest of her life. There is a tiny bit of a love triangle in the story between Wendy, Pete, and Jas, the mysterious and dangerous drug-dealer who is Pete’s rival. We actually see a bit more interaction throughout the story between Wendy and Jas than with Pete, and I was kind of okay with that. I don’t know if this is because of the whole ‘bad-boy’ thing that I have going on lately, or what… but I think I really liked Jas more than Pete. I think Jas really wanted to be a better person because of Wendy. Other than the characters names, there’s not really much similar in the storyline to the original Peter Pan. I actually went into the story kind of expecting a story more like the Peter Pan story, but that’s definitely not what you will get with this story. There was a bit of a plot twist toward the end of the book that kind of caught me off guard, even though there were hints about said twist mentioned in the book a few times. I kept waiting for something really big to happen the closer I got to the end of the book, but the ending was pretty mellow, and it kind of left me hanging a bit. I'm curious to know what happens next for Wendy. I really enjoyed the beach setting for the story, as well as all of the surfing that the characters did in the book. I think that aspect of the book will really make this a great book for summer reading. At 256 pages, this book was a really quick read for me as well. Overall; while the story was not what I expected, I still found this to be a very interesting read. The book will definitely make for a quick summer read to check out while you spend the day at the beach!